Upon arrival in Vipiteno, he flipped a coin and went for the Penserjoch first. Judging by the profiles (Penserjoch / Jaufenpass) this is the more challenging of the two anyway, but by the time he was half way up the Jaufenpass later on, it didn’t feel like that. On the top of the ‘joch’ he had a coffee and some apple pie, because the energy bars where not going to cover his needs today. After that he descended, almost crashing on an Italian moron making a full turn on the road – it’s no wonder he usually doesn’t do the descents on his bike. 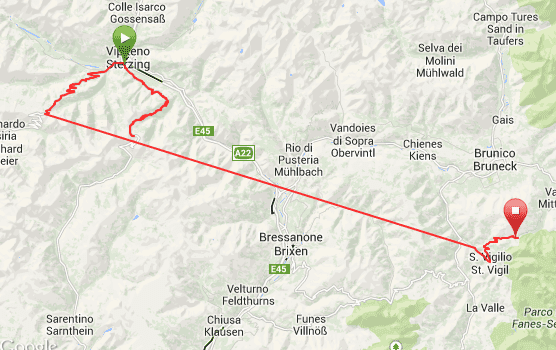 Back in Vipiteno, he turned left again, towards the start of the climb to the Jaufenpass. The length is about the same, just the altimeter gain is around 100 meters less. The flies where not bothering him here (can someone please explain? ), but by the time he reached the summit, his thighs felt like exploding. The only thing he didn’t foresee, was the length of the transfer – it doesn’t look that bad on the map, but since it’s a secondary road you’re traveling the average speed is low and it took them almost two hours to get to to Longega, some 75 kilometers away. While the rest seemed to have done him some good, he immediately felt the strain again upon starting the climb up the Furcia. This one turned out to be a hard hitter as well and it didn’t get any better as the road was going up ever steeper (profile). Total for today: 60.1 km / 3,061 altimeters… Tomorrow the easy side of the Fedaia and that’s probably it – Wednesday, the Monte Zoncolan awaits, Passo del Diavolo.